Tidal Wave is an unyielding force of Autobot destruction, bent on obliterating anything that stands in his way or the Decepticon mission. Prelude: Tidal Wave is a repaint with some mold changes of Titans Return Broadside. I skipped Broadside, though, so this is my first go at this figure. He was originally part of the Siege on Cybertron set, but thankfully there was fellow TF-fan Kim Conter, who sold me this figure at a bargain. Robot Mode: Let us start by comparing this figure to the original Tidal Wave from Armada. He’s…. well, shorter. A lot shorter. I mean, Armada Tidal Wave was an Ultra-Class toy, but due to his design and slim build he stood as tall as most Leader-class toys. Titans Return Tidal Wave, on the other hand, is a stocky Voyager toy, barely half as tall as his previous incarnation. He also carries a different paint job, more reminiscent of the Takara Shockwave version of Tidal Wave. Size differences aside, TR Tidal Wave does bear some resemblance to Armada Tidal Wave, but not a whole lot. Still, he looks like a powerful robot warrior, so mission accomplished… somewhat. Anyway, the robot has good articulation and nice detailing, no problems here. Only a single weapon is included, a translucent orange rifle. While he lacks the characteristic chest guns his Armada predecessor had, you can somewhat approximate them by flipping out the pegs on his chest (actually used in his aircraft carrier mode). So overall, a nice robot mode. Not really that much resemblance to the Transformer whose name he carries, but nicely done. Alternate Modes: Tidal Wave is a triple changer, meaning he’s got two alternate modes. The first and much better one is an aircraft carrier. While it’s basically just Tidal Wave lying on his stomach, the aligning plates on his back nicely form a flight deck for a pretty big aircraft carrier. The tower can flip open and become a seat for his Titan Master partner Fathom (see below). Tidal Wave also comes with a number of small aircraft drones (originally meant to be the Aerialbots for the Broadside version of this figure) to give a sense of scale here. The orange gun can be attached to the side or on top and Fathom can sit in the gunner’s seat. Overall a very nice carrier mode, no complaints. The same can not be said for the jet mode. The front portion of the jet looks pretty good and has an opening cockpit for Fathom, but the rear is basically just a big, not very aerodynamic block formed form the robot mode legs. The jet mode can be modified somewhat by stretching out the legs instead (see pictures 18 through 20), making it slightly more aerodynamic, but it still doesn’t look all that great. So yes, Tidal Wave can become a jet, but there really is no need to transform him into this mode. Leave him as robot or aircraft carrier, he looks way better like that. Partner / Add-On: Being part of Titans Return, Tidal Wave is a Headmaster, naturally. His head becomes Fathom, a Titan Master whose name was never once mentioned in either the instructions or on the Siege on Cybertron box. We only know his name thanks to Trypticon’s Titan Master Crunch. Seriously! He’s a standard Titan Master, nothing more to say here. Remarks: Tidal Wave was among the newly created characters in Transformers: Armada. He was by far the biggest and most powerful Decepticon, nearly taking out the entire Autobot crew during his first appearance and making an impressive showing in the Armada video game, too. Yes, in the tradition of big, powerful guys he wasn’t all that smart. His dialogue was mostly restricted to shouting his own name a whole lot. 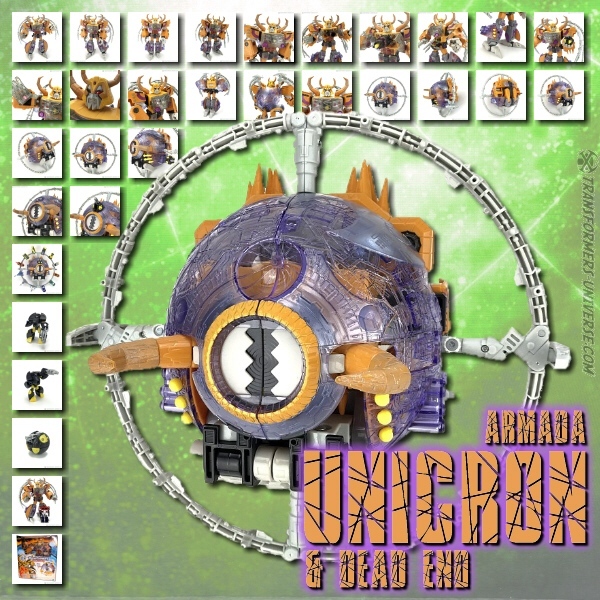 Still, he survived the Unicron Battles and went on to appear in the Energon series, where he was then reformatted into the much smaller Mirage. Since then Tidal Wave has appeared in the IDW Sins of the Wreckers series, where he sported an organic mode (a whale). Repurposing the Broadside figure for Tidal Wave isn’t a perfect match, but he works. I wouldn’t say he is a must-have, especially if you already own the Broadside version of this figure, but if you like Tidal Wave or just need another big, broad Decepticon powerhouse to round out your troops, he is a good choice. Just don’t buy him for the jet mode!